Heimtextil is the biggest international trade fair for home and contract textiles, and because it’s the first trade fair of the year for its sector, it acts as a barometer for the new business year. Interestingly, however, the next edition of it (to be held from January 9th through 12th 2018) will emphasize space, as much as fabrics. Specifically, it’s about spaces in a world where personal dwellings are shrinking due to growing megacities. In the show’s first theme, The Flexible Space, The Micro Home pavilion will present a unique solution to this via London’s Studiomama label. The inventors of the “13m2 house” must use each nook and crevice of the minimal living space. The amazing functionality of the furnishings allow the interior to be easily converted, offering all the functions of an apartment with normal proportions. This combined with a color scheme of Soft Minimal (detailed below) provides the needed visual openness. Next is The Healthy Space. This theme includes both the home and the workplace, as well as centers for learning and for simple relaxation. Designers, architects and materials scientists are increasingly focusing upon designs that actively promote health, satisfaction, attentiveness and productivity. From the integration of houseplants to the importance of sunlight, healthy spaces are on the rise. The third theme of this show is The Re-Made Space. Along with mega-urbanization, comes mega waste. Mountains of it, in fact. So this trend is meant to offer a solution to that ever-growing problem, by thinking of waste as being on an equal footing with other resources. This is intended to make waste a starting point for new design. The fourth trend naturally follows the third: The Maker Space. With décor production being foremost in the Heimtextil planner’s minds, they show why the changing relationship between manufacturers and consumers will bring customers into the designing role. The maker movement has already left a lasting influence on textile productions. But, with the easy accessibility of digital manufacturing technology, DIY instructions, and open-source and downloadable designs, it's now possible for almost anyone to develop personalized products. The January Heimtextil show's themes won’t end there, however. The color and materials news at this show is so significant that they need five themes to fully capture them. The Relax/Recharge trend actually seems counterintuitive. Blue is used here to energize and bright red to calm! Given that urban settings are overloaded with stimuli, these two primary hues are used liberally. Walls, floors and furnishings are completely immersed in color in order to bring energy equilibrium back to city dwellings. Perfect Imperfection focuses on indigo, one of the oldest dyes known to humankind. Much in vogue right now amongst brands and designers, indigo dyeing is forcing producers to accept all the foibles and unexpected gradations of this deep blue color. The Soft Minimal trend emphasizes the multi-functionality of urban living systems. Foremost in this trend are cozy materials, such as wool, felt, linen, and boucle yarn, which give minimalistic apartments warmth and personality using a palette of neutral shades and muted pastels. These colors are complemented here and there by matte black for a touch of elegance. Adapt+Assemble begins with freedom from excess frills in order to rebuild a space that offers geometric and interchangeable shapes and materials. Perhaps with the premise that future urban dwellers will be more likely to rent, than own, it zeros in on such activities as packing, transporting, traveling and moving-made-easy. Industrial materials are converted for home use, and bright, primary colors give this trend a playful look. Finally, there's the Urban Oasis trend, which infuses nature back into city spaces, giving them a sense of well-being. The stars of this palette are lush green shades that suggest both jungles and dark forests, innate hiding places from the stress and interruptions of everyday life. Natural patterns, such as marble and bamboo, team with verdant hues and matt pink. Meanwhile, splashes of floral reds and purples refresh both the body and the soul. The Trend Curve's editorial team will be at Heimtextil 2018 to cover these trends, plus all the other color and design directions emerging at the fair. 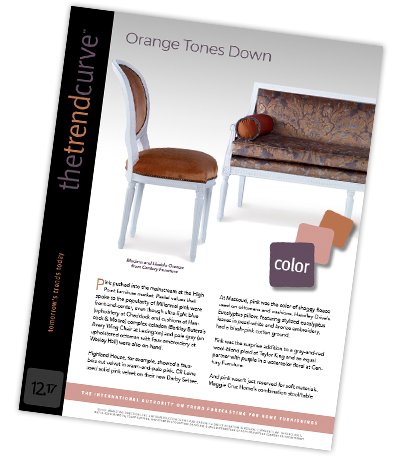 Subscribers can learn all the details in the February issue of The Trend Curve.